This work belongs to the artist's last and mature period. 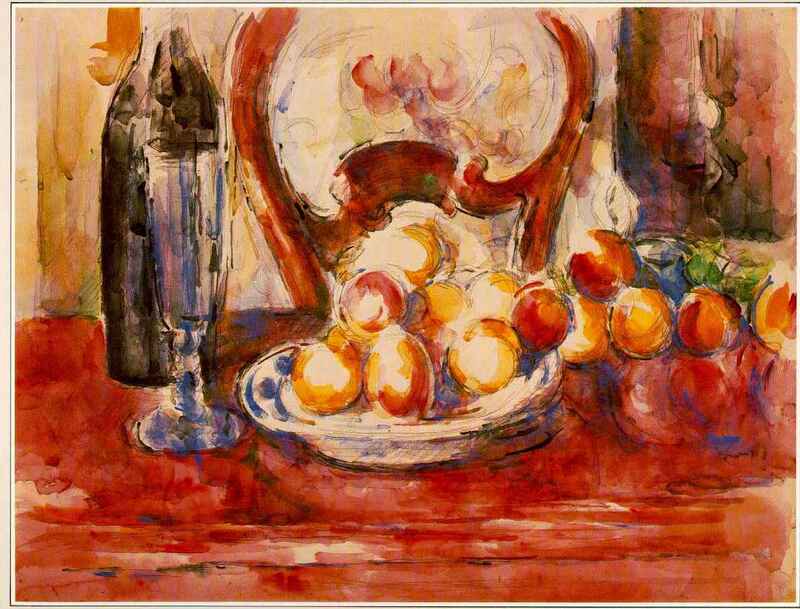 The subject, a still life with apples, was a favorite one; although, paradoxically, the specific subject was probably of little importance to Cézanne, despite his obsession with nature. The still life was painted at the beginning of the twentieth century which has witnessed a great exploration of the visual and emotional effects of color. Cézanne's sense of color was impeccable and often discreet, but in this particularly rich painting the two primary colors, blue and red, are used with boldness. A distinctive technique of Cézanne's, which was considered a daring innovation at the time, was leaving part of the paper blank: here, the warm-toned paper indicating those areas of the apples which catch the most light. In this way the artist suggests volume while representing light. Such a device was part of Cézanne's struggle to break away from what he considered to be the insubstantial atmospheric effects of the Impressionists. The picture exemplifies another important aspect of Cézanne's vision, style and technique. When the viewer tries to join up the right and lefthand rims of the apple bowl, he or she discovers that Cézanne has been looking at and rendering the scene in front of him from more than one angle, thereby breaking with the typically monocular vision of Renaissance perspective. More important, this shifting of viewpoint may be seen as a step in the direction of Cubism. The brushstrokes vary in size more considerably than in Cézanne's oil paintings. The marks which complement and emphasize the pencil contour round the apples are literally drawn with a brush - a small sable brush or perhaps the tip of a large one. Cézanne did not lay on washes successively covering whole areas of the paper. He placed large and small planes of pure color in a manner that keeps the forms open. The transparent watercolor has been laid on in a way that keeps the whole pictorial architecture in a state of pleasurable continuity. The painting is, as it were, complete at every stage. Aware of the potency of suggestion, Cézanne always stopped long before the paper looked overworked.